Designed for small-flow industrial applications. 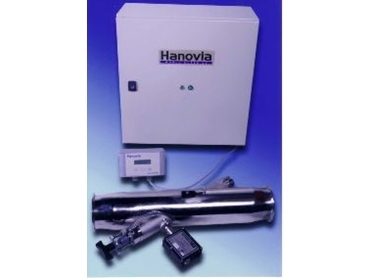 HANOVIA, represented by Fluidquip Australia , has launched its new Quantum in-line medium pressure UV system. This low-cost device is designed specifically for small-flow industrial process water applications (up to 120m3/hr) in the food, beverage, brewing, pharmaceutical and electronics industries. It is also suitable for treating water in small pools or spas. The system was developed using high-end CF13 modelling software and meets stringent quality requirements. Biodosimetric testing of the systems has also been undertaken to validate the performance of the products. The Quantum has a radical new design, with the UV lamp positioned at a 250° angle to the flow to maximise contact time. This in-line design minimises headloss and ensures optimum disinfection by ensuring all the fluid passing through the chamber receives the minimum required UV dose. In addition, power per unit length is lower so the UV lamp will last longer. The design also allows quick and easy lamp replacement. A novel feature of the Quantum is its local control unit, which displays UV intensity, alarms and an hours-run counter. This unit can be positioned in wet areas, adjacent to the UV chamber, while the power unit can be located up to 100 metres away in a dry area. Options with the Quantum include a manual wiper and autobleed facilities. As the system is so compact, installation is simple and can usually be done within existing pipework with minimal disruption to the plant.